Review: The red and orange flames of the engine were flaring into the balloon making us go higher and higher. This book titled Spider Bite, was written by Justin D' Ath and is the 5th book in the Extreme Adventure series. It is a realistic fiction book that is frightening, moving and thrilling. The main character is Sam Fox, a 12 year old boy with a strong will. 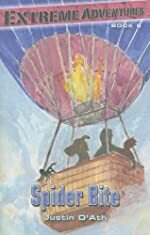 A red headed lady is stuck in a tree from a balloon crash, so Sam climbs the tree and gets the balloon out but, the engine lights back up with Jordan and Harry, Sam's little twins, and suddenly they are flying away. They get higher and higher, but Sam gets in and steers it. Jordan gets bitten by a Sidney funnel web in the balloon. It is a very dangerous spider. Sam has to get Jordan to the hospital, but Sam steers the balloon to close to a plane and gets blown off course. They end up at the zoo in the bear pit. He climbs out and goes through many different animal pits until he finely finds the antivenin. But, it just may be too late. Around the first few pages I was already hooked. My excitement filled my own body with anticipation. The hurry and tension got higher and higher with each page, and the better it got the faster I read so I was reading pretty fast and I was kind of disappointed when I was done. The ending made me want to read more and see if the brothers ever get reunited. The genre is realistic fiction because this could have happened to anybody in Australia. Sam demonstrated good inferring and thinking skills. Sam's main goal was to land until Jordan got bitten and changed course for the hospital. Next chance I get, I am getting the next book in the Extreme Adventure series. We would like to thank Kane Miller for providing a copy of Spider Bite for this review. Have you read Spider Bite? How would you rate it?